In addition to these active local business people, we also have stories written by and about Citrus County residents! We welcome articles from all of our readers. 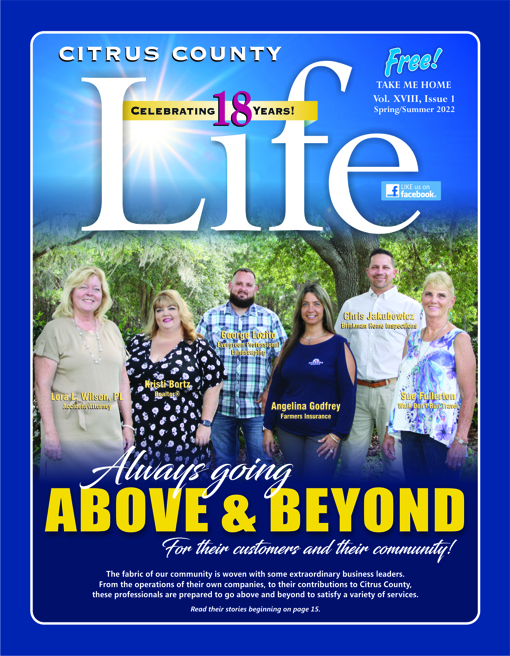 Please send your article or story ideas to: kathy@citruscountylife.com. RELIEF SHARE: RECOVERING MEDICAL SURPLUS TO SAVE LIVES: This small Citrus County non-profit partners with local healthcare facilities, student groups, regional support programs and international charities to get first aid and medical supplies to those who need them most. CASA (CITRUS COUNTY ABUSE SHELTER): CASA is a confidential safe haven for those escaping domestic violence. Their mission is to help victims and survivors by providing shelter, safety, intervention, and education. Volunteers and donations are always needed. CARING K9S: Caring K9s is a non-profit, volunteer-based organization of dedicated therapy dog handlers and their dogs. The objective of this group is to join caring individuals, along with their personal dogs, to share kindness, comfort and love within the community. A SERVICE LIKE NO OTHER: Back2Bright, LLC, provides structural soft washing as an alternative to pressure washing. This local company also gives back to the community with their #FreeSoftwashFriday, a new program in place to assist non-profits and those in need. There are many more interesting stories in this issue. 400 locations throughout Citrus County.